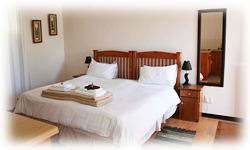 Some rooms have two single beds which can be joined to give you a king size bed. Other rooms have a queen size bed. Does not have a kitchen or cooking facilities. This room is in the front section of our property, and not around the pool where the other rooms are. 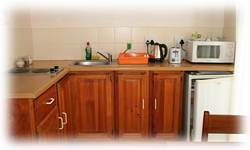 All rooms are strictly non-smoking, our designated smoking area is the braai area. which stays in the rooms and curtains. 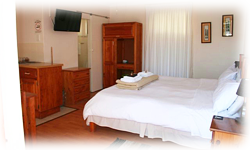 PLEASE NOTE - our Guesthouse is a private property and Right of Admission is reserved. Children 10 years of age and older are welcome, but will be charged adult rate. Unfortunately we cannot cater for children younger than 10 years of age. We are not wheelchair friendly. later than 21h00 as our reception closes at 21h00. Check-out time is strictly by 10h00. your vehicle. This applies to trailers as well. We do have house rules. A copy can be mailed to you on request.